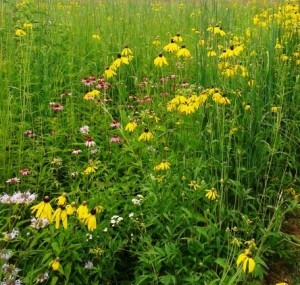 After many years of sowing wildflower seeds in plantings small and large across Michigan, we have developed a mix of species proven to establish consistently. We think it's a good idea to start with this sure to show up mix of wildflowers and prairie grasses that you can count on. Once established, you may consider enhancing the area with additional species by seed or plants. Otherwise, simply continue to enjoy your wildflower meadow as is. This mix is for primarily full sun and dryland soil types.